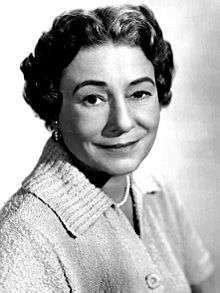 Thelma Ritter (February 14, 1902 – February 5, 1969) was an American actress, best known for her comedic roles as working class characters and strong New York accent. She received six Academy Award nominations for Best Supporting Actress, and won one Tony Award for Best Leading Actress in a Musical. Ritter was born in Brooklyn, New York, in 1902. After appearing in high school plays and stock companies, she trained as an actress at the American Academy of Dramatic Arts. She established a stage career but took a hiatus to raise her two children by her husband, Joseph Moran, an actor turned advertising executive. Ritter did stock theater and radio shows early in her career, without much impact. Ritter's first movie role was in Miracle on 34th Street (1947). She made a memorable impression in a brief uncredited part, as a frustrated mother unable to find the toy that Kris Kringle has promised her son. Her second role, in writer-director Joseph L. Mankiewicz's A Letter to Three Wives (1949), left a mark, although Ritter was again uncredited. Mankiewicz kept Ritter in mind, and cast her as "Birdie" in All About Eve (1950), which earned her an Oscar nomination. A second nomination followed for her work in Mitchell Leisen's' classic ensemble screwball comedy The Mating Season (1951) starring Gene Tierney and John Lund. She enjoyed steady film work for the next dozen years. She appeared in many of the episodic drama TV series of the 1950s, such as Alfred Hitchcock Presents, General Electric Theater, and The United States Steel Hour. Other film roles were as James Stewart's nurse in Rear Window (1954) and as Doris Day's housekeeper in Pillow Talk (1959). Although best known for comedy roles, she played the occasional dramatic role, most notably in With a Song in My Heart (1952), Pickup on South Street (1953), Titanic (1953), and The Misfits (1961). Her last work was an appearance on The Jerry Lewis Show on January 23, 1968. Ritter died of a heart attack in New York City, just nine days before her 67th birthday. Awarded Best Actress (Musical) (1957) for New Girl in Town in a rare tie (with her co-star, Gwen Verdon). ↑ "Appearance on Jerry Lewis Show". Thewindmillsofyourmind.com. Retrieved 2012-12-04.